My hiking buddy (Wayne) and I had plans to go and explore a new to us portion in Bankhead National Forest this past weekend. I was excited to get back to my favorite area and find some new things now that the weather had finally cooled down enough to make hiking enjoyable. On my way to Bankhead, I received a text from another friend (Thomas) that is VERY familiar with Bankhead Forest and the Sipsey Wilderness. His family had lived in Bankhead many years ago and knows the history and location of many of the special areas and enjoys going to find them. The text said that he was taking his nephew out this weekend and wanted to know if I wanted to join him. I quickly contacted Wayne and we agreed that this would be a great experience. We knew hiking with Thomas meant everything was going to be “off-off trail” meaning no trail whatsoever would exist, but the reward would be worth the journey. I replied to Thomas that we were on the way and would meet them there. All of us arrived at Thompson Trailhead at about the same time – just after dark. We had planned to camp in Whiteoak Hollow just before the shortcut up the ridge to the Big Tree. Although we are all very familiar with this area, it is much more difficult to see and navigate in the dark. After walking in a circle in the correct area (literally) we decided it was getting late and we would camp at the large campsite at the junction of trial 206 and Whiteoak Hollow since no one was there. We set up camp and settled in around the fire ring by the glow of a battery operated lamp since there is currently a fire ban due to the drought. Friday night was cool but not cold and we all kept warm in our hammocks. There was a short but heavy rain around midnight that didn’t provide any water in the streams but at least kept the dust down as we went hiking the next morning. 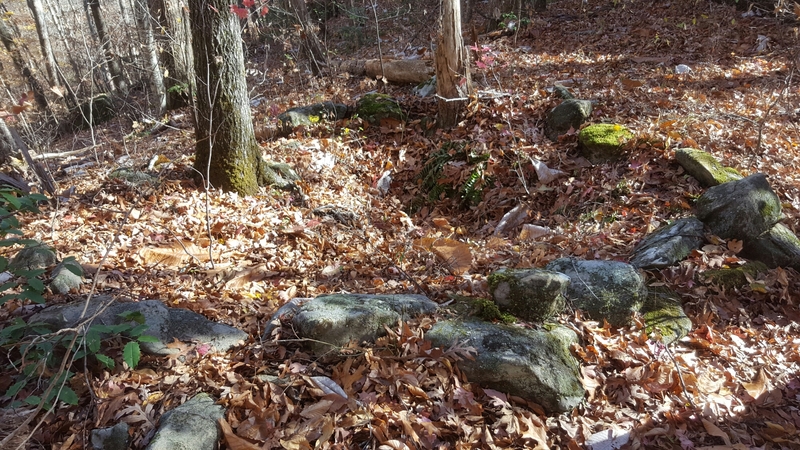 Our first agenda Saturday was to find an old moonshine still site in Whiteoak Hollow. 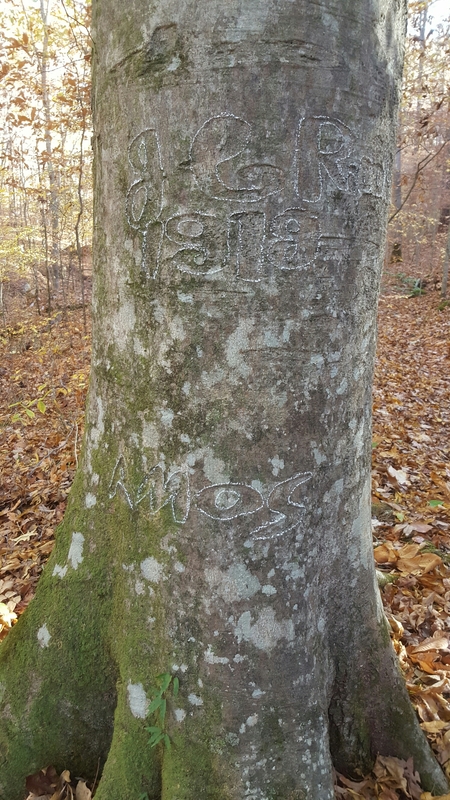 As we headed up Whiteoak Hollow, Thomas had outlined some carving in a tree that many people pass but never notice. 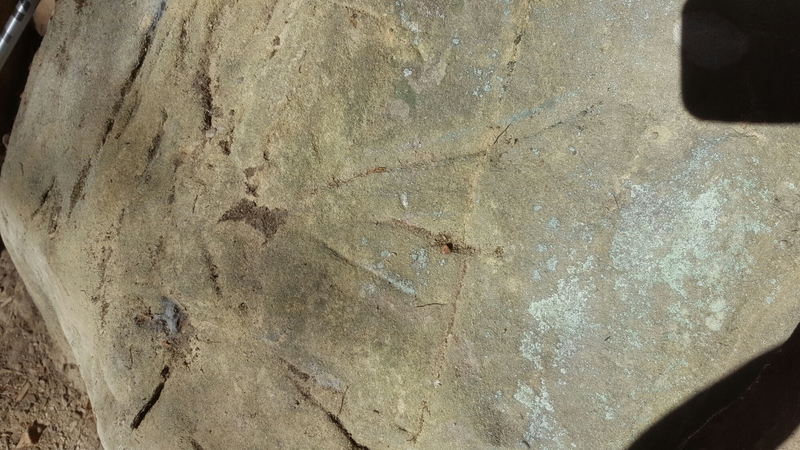 In the tree is carved “J.C. Riddle 1918” and the name “Amos.” This is significant because Amos Spillers married one of J.C Riddle’s daughters. This is the kind of information that is shared by Thomas and brings the area “alive” by not just exploring but also knowing the history behind the things we find. Just east of the shortcut up Whiteoak Hollow we found the remains of two stills tucked away in a bluff covered in Hemlock trees. 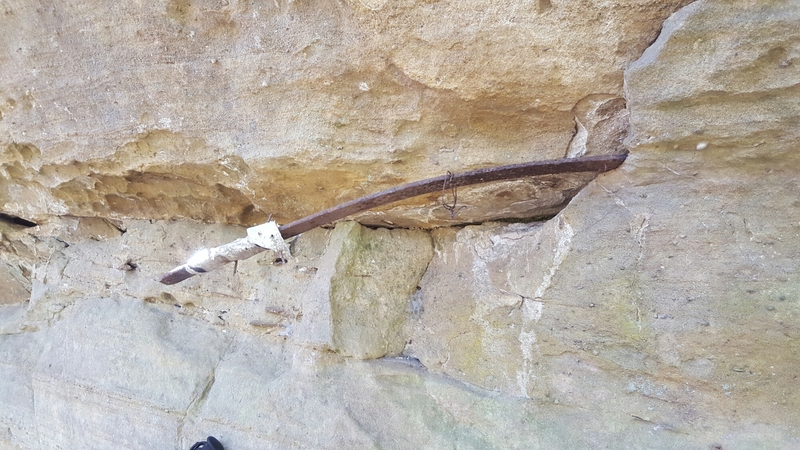 All that remained were two rock lined holes on either side of the stream and a few pieces of metal. While to the uniformed they don’t appear to be much, this was actually a pretty popular method during that time and a sign of that particular activity in Bankhead. I didn’t take any pictures of this site, though. We headed back to camp after a few minutes for snacks and planning what other adventures we embark on later that morning. After a few minutes of discussion, Thomas offered to show us some old home sites and another old still site further down Thompson Creek and some sights on the other side of the creek on the way back. We eagerly took him up on his offer. Downstream on Thompson Creek we headed and after a few minutes we left the trail and climbed the ridge following an old road. 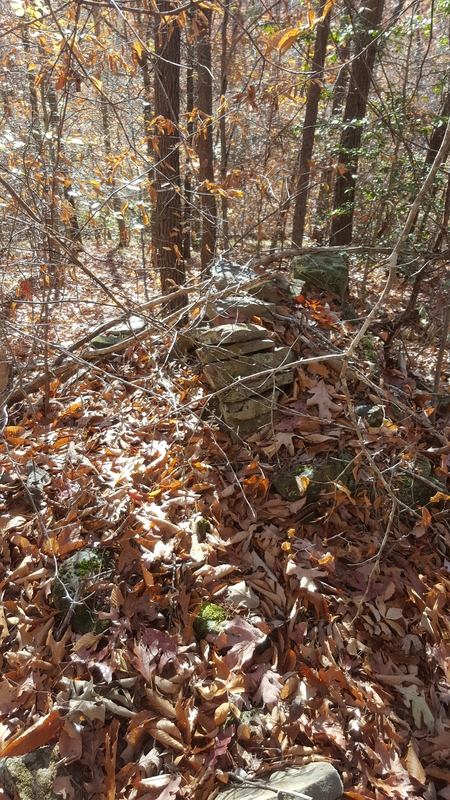 Eventually we came across the remains of two old homesteads. All that really remains are a few stacked stones from the fireplace. 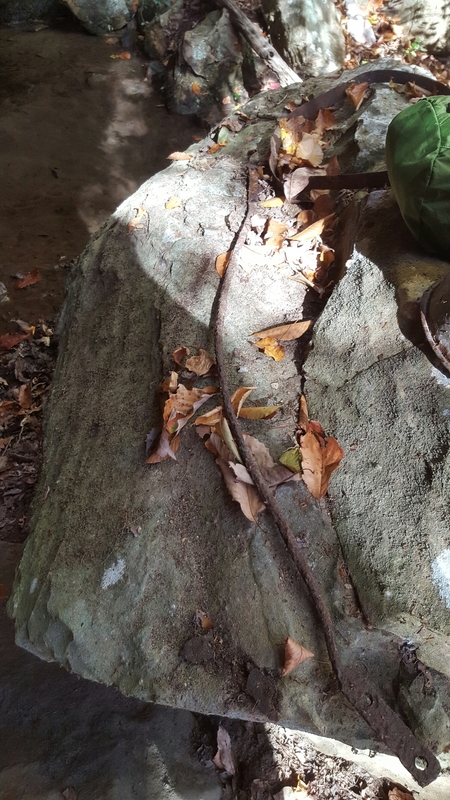 One key to finding things such as this is to remember stacked or symmetrical rocks (such as circles) do not occur naturally and it must signify something. Sometimes the “why” may not be known but as you research and explore sometimes they can be figured out. After a few minutes at the old homesteads, we headed around the ridge to the old still site. 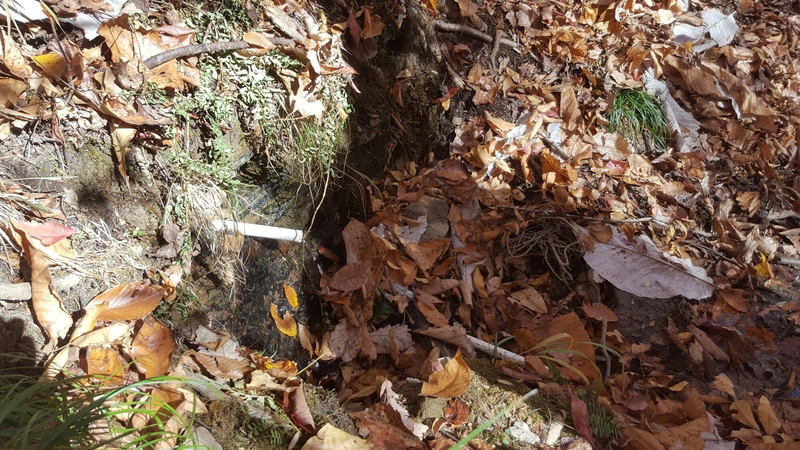 This site was further off trail so more item remain. 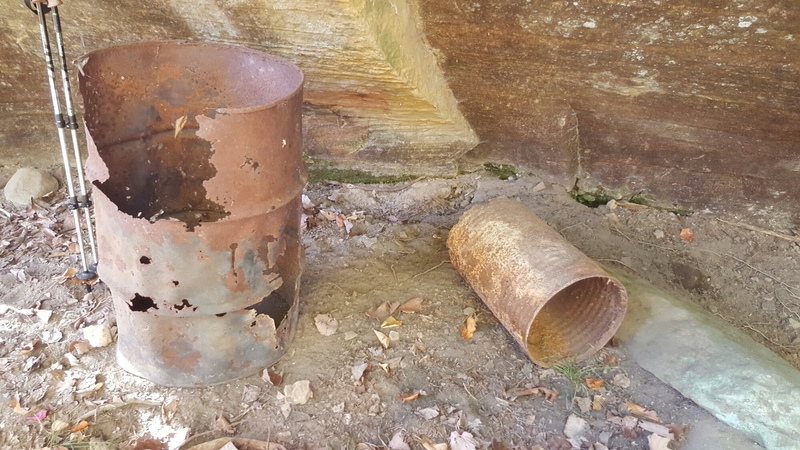 There were the remains of an old cook pot, a barrel, a metal bucket, some wagon parts, and other scraps of metal. 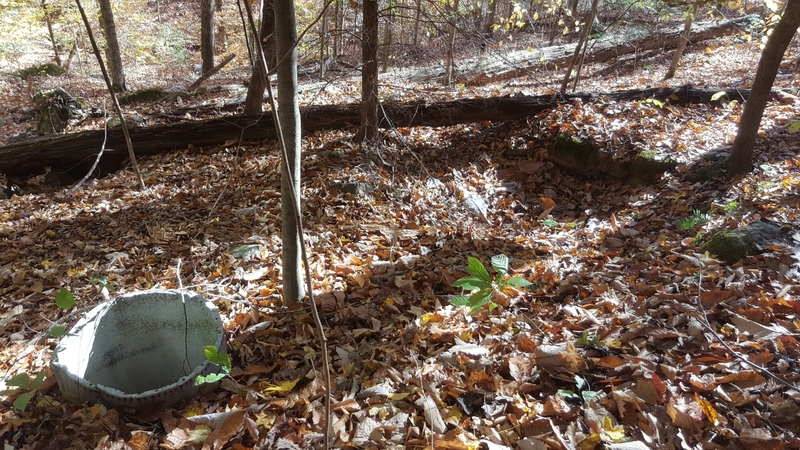 Just off to the side of one cook pot was the remains of a larger in-ground still similar to the ones we saw up in Whiteoak Hollow. We stayed here for some time as Thomas showed us pictures on his phone of various sites around Bankhead he has discovered. Now we headed back, crossing the dry Thompson Creek and climbed a ridge once again. After a short climb we found ourselves at another bluff line. 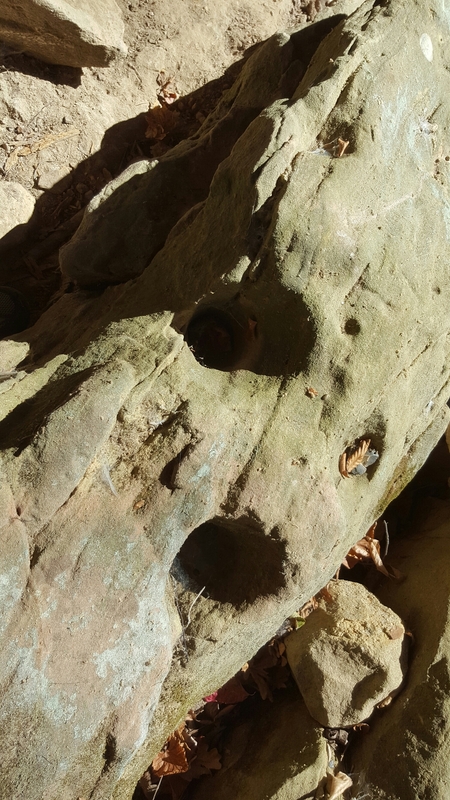 In the rocks at the foot of the bluff were several Native American mortar stones and grooves where they had sharpened or shaped other tools on the rocks. This was the location of the infamous “Baby Pig” story that has been told around the campfire on a few occasions. Next we walked around the bluff to another odd site. 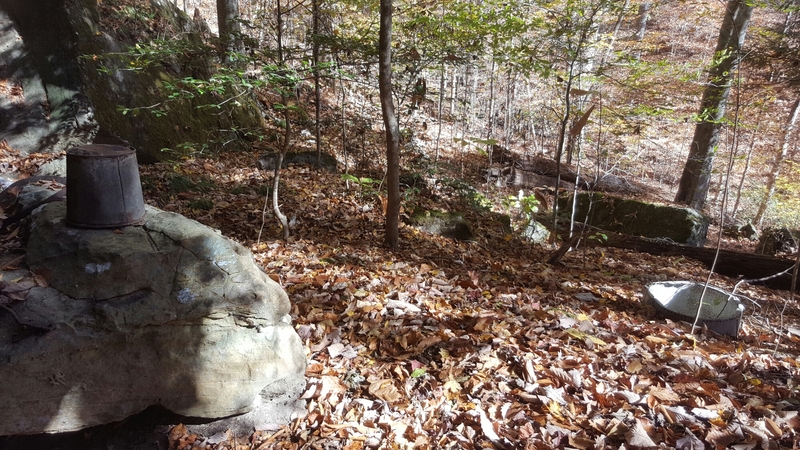 On the saddle of a ridge was a large (10 ft or more) circle of large rocks. It was way too large to be a fire ring and too symmetrical to be accidental. In the center the ground had a large depression. No other markers or identifying items were around. It was just an odd site. Climbing down the other side of the ridge we headed roughly in the direction of upstream. After a few minutes we came across a flowing spring. This was really a surprise as dry as it has been, but the spring was flowing. We filled and filtered water and headed back to camp, walking up the dry streambed of Thompson Creek. Upon reaching camp, it was sadly time for Wayne and I to tear down and head back. As we sat around the fire ring, I looked up and took one of my favorite pictures of the trip. 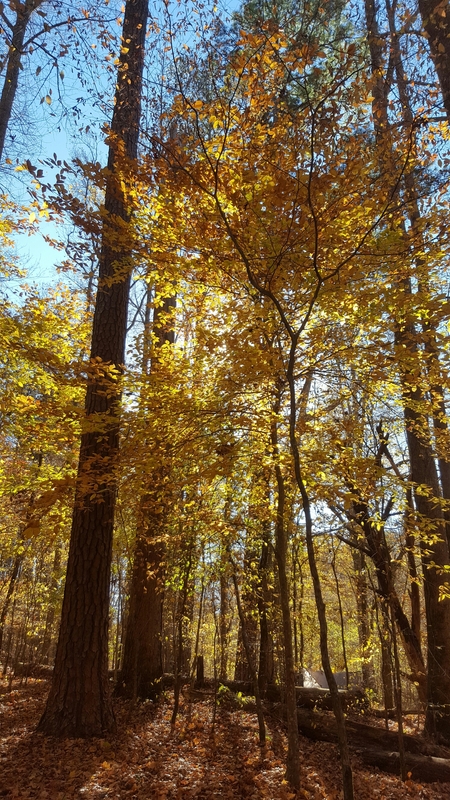 Although it was a short trip, I had a great time with friends, met someone new, and saw just a few of the things the Sipsey Wilderness has to offer. Thanks for sharing! It is so cool to hear the local history and hear about things off the beaten path. Thank you. There is SO much off the beaten path to discover. I have the honor of knowing someone who enjoys hiking and sharing the history. Unfortunately, we don’t get together too often.